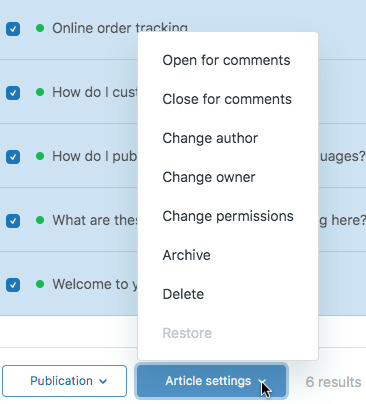 From an articles list, you can update one or more articles at once using the bulk actions options. For example, you can publish a batch of articles at once or add a labels to several articles. Select one or more articles to update. You can select a maximum of 30 articles at a time. To select 30 items at once, select the check box beside the number of results at the top. Click one of the bulk actions menus at the bottom, then select an option. The bulk actions that are available depend on your plan. Click to confirm that you'd like to perform the action, or enter your update, if necessary. For assign, select a team member and enter a note, then click Assign. For change labels, select or deselect labels to add or remove them or enter a new label, then click Change. For more information, see Changing article labels in bulk. For restore, select a section for the article, then click Restore. The action is applied to all the selected articles. But there is no way to deselect labels. None of the labels are selected when I open the bulk editor. When I check one, I can apply, but I assume that will add it. If I check it and then uncheck it, the Confirm box goes away and I can't do anything. How can I remove a label in bulk? Labels that appear on all the selected articles have a selected box with a checkmark. If you deselect that checkbox, the label will be removed from all the selected articles. Labels that appear on some but not all of the selected articles have a selected box with a slash mark. If you click that box, the slash turns to a checkmark (indicating the label will be added to any selected article that doesn't already have it). If you click it again, the box is deselected (indicating the label will be removed from any selected article that contains it). I'm going to make that clearer in this article that is specifically about updating labels in bulk, because you are right that it can be hard to figure out. Thank you! That's definitely what I would have suspected. Mine aren't doing that. I double checked my articles and verified they have some labels, but when I try to bulk update them, none of the labels that are applied are checked or even have the minus. They are all empty. Yea, that doesn't sound right. You might have to contact support@zendesk so they can take a closer look at what's going on. Good luck! For enterprise: why is it that I am able to only use the Article Settings bulk feature for articles that are in "All articles" status in the left hand side? I am unable to use it for "Work in progress", "Ready for review" etc? Hey Dominic! Sorry for the delayed response. 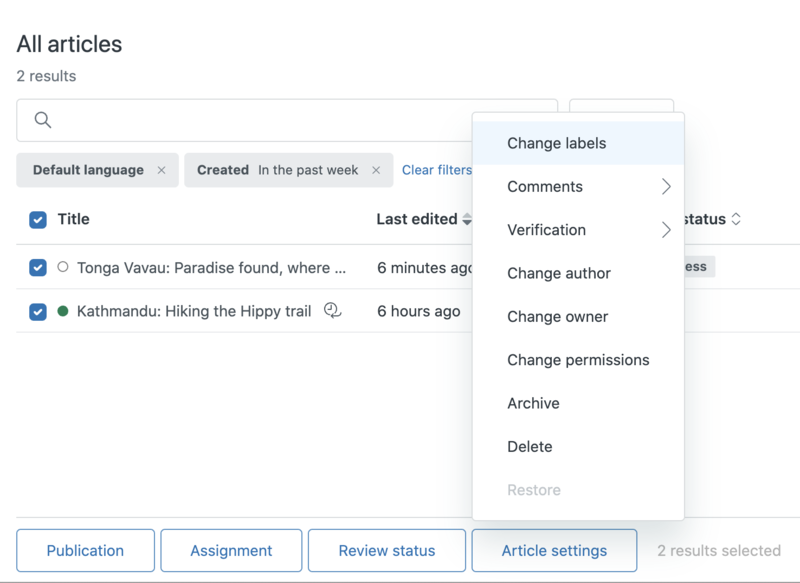 You should be able to take bulk actions on Work in Progress or Ready for review articles. However, there might be some actions that are limited based on the type of article it is. For example, you can't take bulk actions on articles that are language variants of a source article. If you add the parameter Source > Yes to your list, do you see the "Article Settings" menu reappear?